And my feet really really hurt. I have not been able to walk for very long the past couple of days. Well, I can, but only by gritting my teeth all the while and forcing myself to keep walking/standing. Consequently, I have lost nearly all desire to see Akihabara and Ginza. I’ve seen Harajuku, Shinjuku, Asakusa, Ueno, Roppongi. I think that’s sufficient. Not sure how I’m going to last the next two days… hopefully my ankles feel well enough tomorrow that I can go to Disneyland. 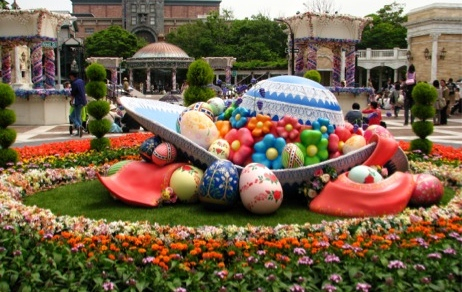 Oh, and pic above is part of the spring/Easter decorations in DisneySea. HOW CAN YOU NOT GO TO DISNEYLAND? !